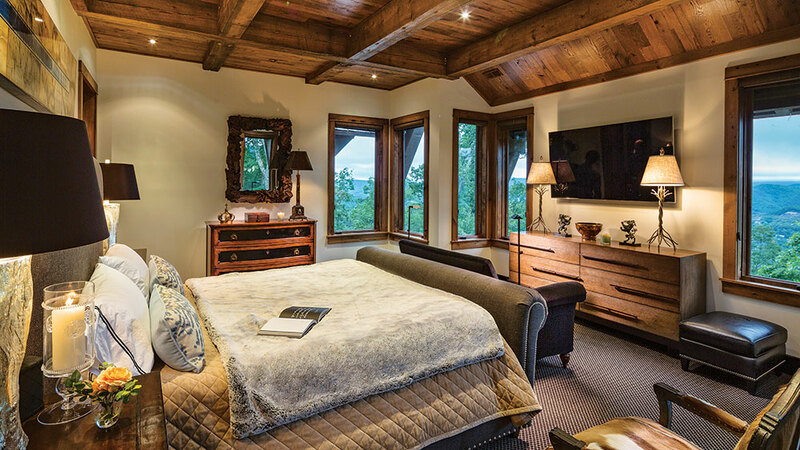 When golf legend and six-time Major Championship winner, Nick Faldo, decided to build a vacation retreat in the Allegheny Mountains of West Virginia, it’s fair to say it wasn’t just about the house. Overlooking the famous Old White TPC golf course at The Greenbrier resort, the 6,526-square-foot home brought Nick’s passion and career into his own back yard — literally. 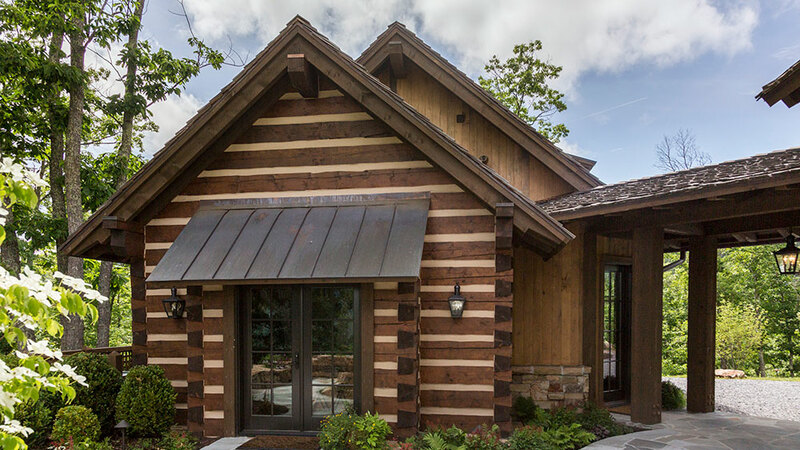 To create the mountain-style home that Nick had in mind, Jay and his team worked off those custom plans, bringing the house to life through a mix of all-natural materials. 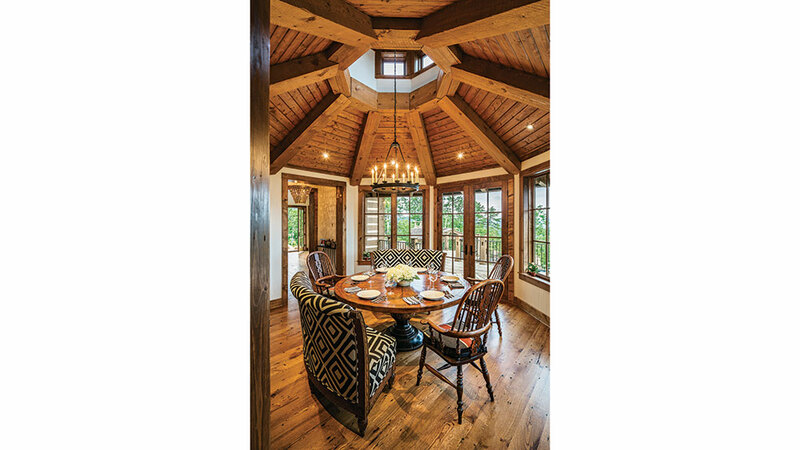 Large, Engelmann spruce logs were used for the full structural timber frame that takes center stage in the home’s great room, while the rest of the main house was conventionally built before timber accents were added. 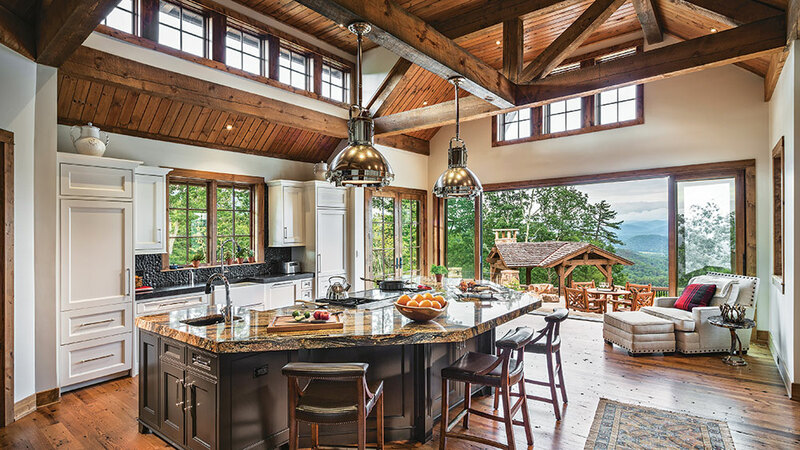 Tongue-and-groove ceilings top off each of the interior spaces, and smart window placement (including clerestory windows in the kitchen and eating area) brings in added light and frames the mountain views beyond. While the home’s interior is impressive, visitors are wowed before ever setting foot inside. 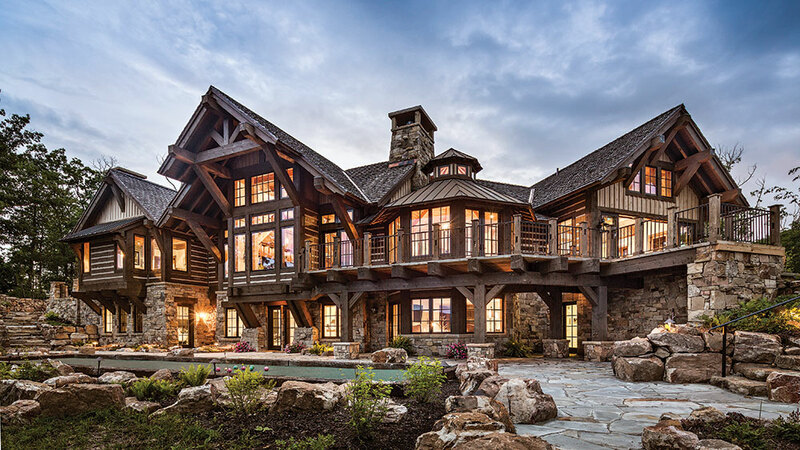 A blend of finishes, including hewn-plank siding, vertical board-and-batten, stacked stone around the foundation and a combination of wood-shingle and metal roofing crafts a perfectly rustic vibe. Both the main and lower levels walk out to stone patios, while the rear of the home also features a swimming pool and putting green. Another stand-out element: A freestanding “man cave” that’s accessible from the main house through a covered, open-air breezeway. 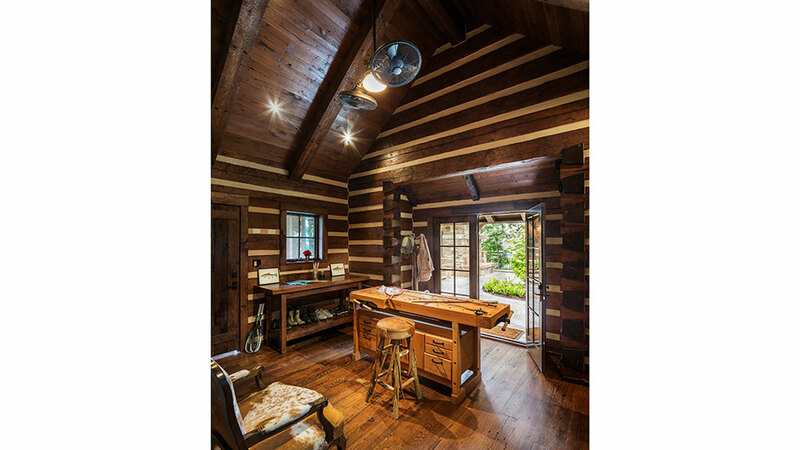 The separate structure includes an outdoor fireplace and fly-tying room that’s the only full-log space in the house, according to Jay. Dovetail corners and thick chinking complement the home’s blended aesthetic. The home’s lower level walks out to a sprawling flagstone patio, complete with its own putting green. The multi-level outdoor space also features a swimming pool and a second patio space adjacent to the main-floor kitchen. hile the home is technically a hybrid structure, the great room was constructed with a full Engelmann spruce timber frame. 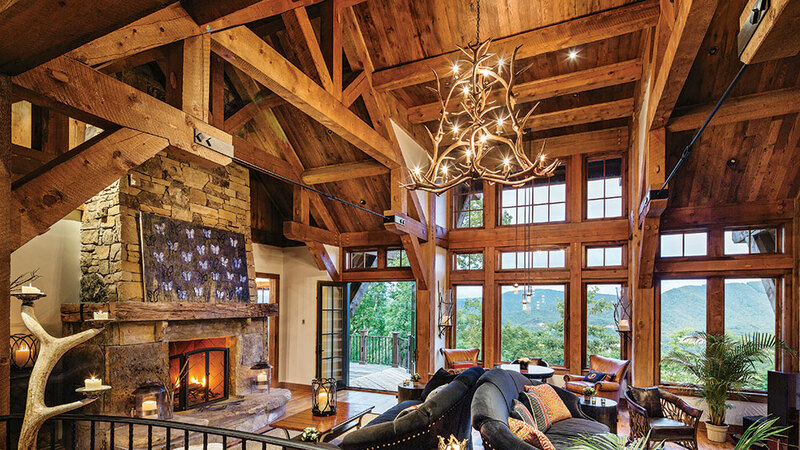 Tongue-and-groove ceilings, a stacked-stone fireplace and rustic decor in the form of an antler chandelier and nail-head sofas add to the home’s masculine mountain style. A light spot in the home’s otherwise wood-filled interior, the classic white kitchen features timber accents and tongue-and-groove ceilings overhead. A collapsible wall paired with clerestory windows creates a seamless transition from indoors to out. Located off the kitchen, this bump-out is the perfect spot for enjoying a casual meal. A combination of traditional Windsor dining chairs and upholstered settees add to the home’s curated feel, while bringing flexibility to the way the room can be used. In one of the home’s four bedrooms, custom-sized windows — some set at 90-degree angles — were left uncovered to maximize the mountain views. 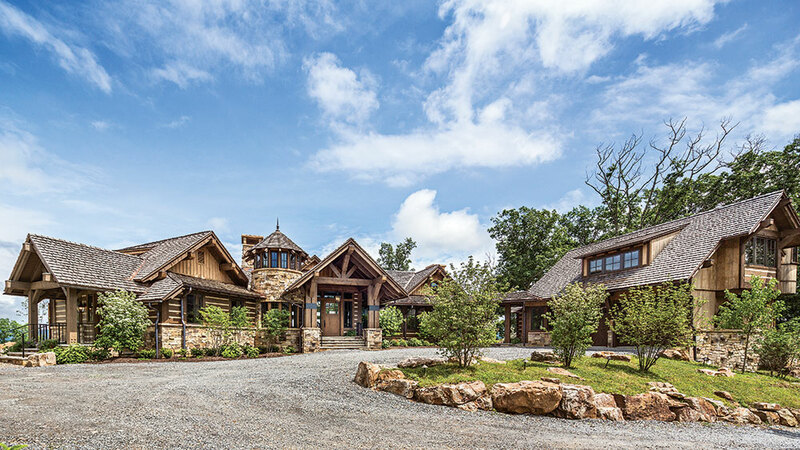 Perched atop a ridge in West Virginia’s Allegheny Mountains, the 6,526-square-foot home settles in seamlessly with the land, thanks to a blend of natural exterior finishes. The square timber entry hints at the large timber frame inside.